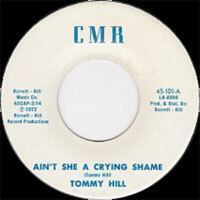 Chanteur Country US né le 27 Avril 1929 au Texas, Tommy Hill est le frère de Goldie Hill et a enregistré chez Enterprise (51), Decca (52-53), Feature (53-54), Hickory (54-56), Starday (59-62) et CMR Records (72-73). Il est décédé le 31 Mars 2002. Tommy Hill never quite made it as a country star, despite a couple of decades of trying and crossing paths with (and even working for) stars and legends like Smiley Burnette, Webb Pierce, Hank Williams, and Johnny Horton. He wrote some very successful songs and produced important hits by others, and also left some hot rockabilly sides behind. Born on a farm near Coy City, TX, on the eve of the Great Depression, Hill was one of four children. He spent a good part of that childhood picking cotton in order to help his family survive. He also listened to the radio and especially enjoyed the music of Jimmie Rodgers, the Delmore Brothers, Cowboy Slim Rinehart, and Wayne Raney. It was while dragging sacks of cotton through the fields that Hill vowed to try for a career as a musician. He learned guitar listening to Ernest Tubb's lead player, Jimmie Short, and was proficient enough as a teenager to get a gig playing on radio with Big Bill Lister in San Antonio -- he was good enough, in fact, to blow the competition out of the studio. With his brother Ken, Hill got gigs working with Red River Dave McEnery, and one day in 1948, musician/actor Smiley Burnette (of Gene Autry and Roy Rogers fame) passed through San Antonio and found himself in need of a guitar player or two. Tommy and Ken were hired for the gig and stayed with Burnette, who brought them to California, which got them into the background scenes in his movies as extras and musicians. The Hollywood work only lasted for 18 months before Hill and his brother returned to Texas to try and really make it in the music business. Sometime in 1949, Hill was playing in a group called the Texas Hillbillies, and he managed to cross paths during the years that followed with Hank Williams and Johnny Horton. A couple of years later, Hill got picked up by Webb Pierce as a fiddle player. They only worked together for about four months, during which time Pierce cut one of Hill's original songs, "Slowly," before Hill decided to form a band of his own. Pierce's manager, Tillman Franks (who also later managed Horton), got Hill a contract with Decca Records in 1952. 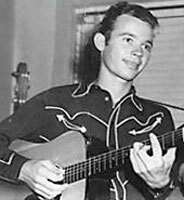 He formed his own band in Shreveport, LA, with his sister Goldie, who had a hit with Hill's "Let the Stars Get in My Eyes" (retitled "Don't Let the Stars Get in Your Eyes"), which he had originally written for Kitty Wells. 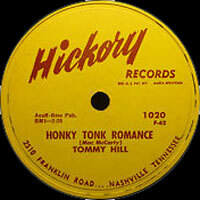 Hill had little success with Decca and was persuaded to join Hickory Records, the recording arm of Acuff-Rose publishers. By that time, rock & roll was rumbling out of the South and the Midwest, and Hill ran across a fellow Texan with a yen to record, steering him to Decca in Nashville -- that marked the start of Buddy Holly's commercial recording career. He also saw Ronnie Self in concert and took to heart the kind of music that the kids were listening to. He tried his hand at rockabilly, recording a single session one night that took more than 35 years to see the light of day. Somehow, however, success eluded Hill. He had no hits during his three years at Hickory Records, and he subsequently hooked up with Starday Records, where he eventually became a producer, handling many of the label's releases until 1968. After a stint with MGM Records, Hill went into partnership with his fellow guitarist, Pete Drake, in the Stop label, which recorded the Jordanaires and Johnny Bush, among others, during its brief existence. Finally, in 1972, Hill formed Gusto Records, and two years later went into partnership with Moe Lytle; the two eventually bought out the King and Starday labels, and Hill was the producer of Starday's biggest hit, "Teddy Bear" by Red Sovine. Hill hasn't been heard from since the early '60s as a recording artist, and none of his country sides are currently in print. 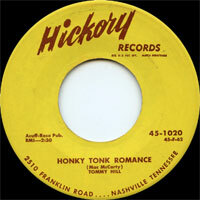 In 1993, however, Bear Family Records released his long-lost rockabilly session from that June night in 1958. Despite his talent and his years of playing and writing, Hill never scored a hit; however, as he observed in Colin Escott's notes for Get Ready Baby, he had a habit of always giving his best songs away to others. That Life That I'm Living / What Is It, Darling? Ain't She A Crying Shame? / Why-Why-Why?